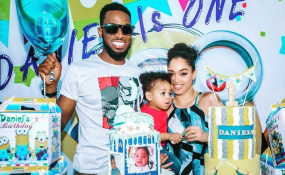 The police in Lagos on Monday said singer, Dapo 'Dbanj' Oyebanjo, would report the circumstances that led to his son's death to the police when the mourning period is over. The police also said that a delegation from the command, led by the Divisional Police Officer, Ikoyi Division, Mustapha N'Abba, were at the singer's residence on a condolence visit but did not meet anyone at home. The statement read, "The Commissioner of Police, Lagos State, CP Edgal Imohimi, on behalf of officers and men of Lagos State Police Command, wishes to commiserate with the family of Mr and Mrs Oladapo Daniel Oyebanjo a.k.a D'BANJ @iambangalee on the death of their one year old son, Daniel(Jnr) Oyebanjo whose sad event took place yesterday 24/06/2018, at the Ikoyi-Lagos residence of the family. "The CP wants the family to know that at this period of their grief, the entire Command shares in their pain. It is expected that when the mourning period is over, the family will formally report the circumstances that led to the unfortunate death of little Daniel to the police. May his soul rest in peace. Amen." Daniel, who celebrated his first birthday in May, reportedly drowned in a pool in his parent's Ikoyi residence. The singer's other colleagues and fans alike have also been commiserating with him. Dbanj and his Management are yet to make any official statement.